Are you ready to rumble? Because not everyone is, at least not right away. Most potential clients that contact us for the first time already have a specific show they want to use our interactive trade show booth games at. But a good number also are just doing research on promotional activities to boost their trade show results. They like our games, but now need to choose their first show to use them. 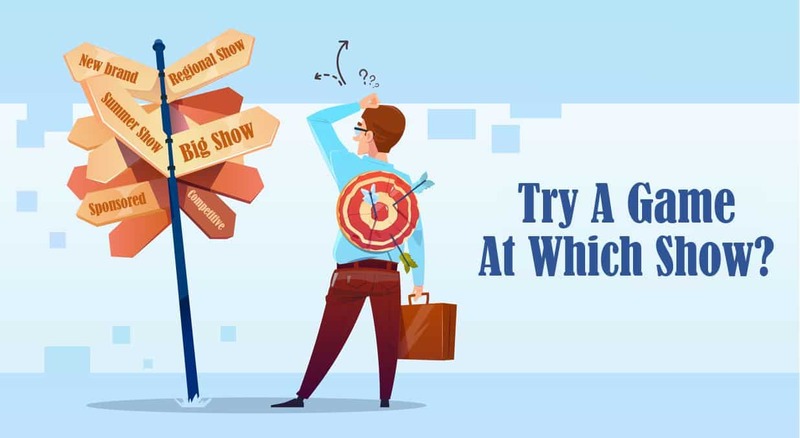 A big show: At your bigger shows you not only need the booth traffic to make them a success, but your larger show budget can more easily absorb the cost of the interactive trade show booth games. Big industry shows are very often the place we get used first – but they’re not the only place. A very competitive show: Our games can help you stand out when the competition is stronger. You know the shows – where exhibitors can’t get by just waiting for attendees to wander in, or because the show attendees are so valuable that exhibitors up their game to get their attention. New brand or marketing message: In makes it easier to integrate a new interactive like our game when you’ve already got your team focused on making a change to your trade shows. You have your new brand or marketing message going into exhibit graphics, so they’ll match the game. And, when you’ve got a new brand or marketing message, it’s more motivation to use a flashy game to call more attention to it. Non-mission critical show: This is more for the cautious type. Some of our clients want to try our games, but don’t want to risk implementing a new activity when the stakes are high. If this is you, pick one of the least important shows on your schedule, which will still let you can see how well our games boost results. Perhaps your next regional trade show? Summer show: When you have dozens of trade shows to execute, adding a promotion in the middle of the busy season is even more difficult. So instead, try out our interactive trade show booth games in the Summer, when you’re less busy than the Spring or Fall trade show season. Willing sponsor: Do you have an exec responsible for one or more shows who is more eager to try new marketing ideas? It makes things go easier when you have the person approving the plan – and the budget – on board with innovation. Your next show: There’s no time like the present! As Nike says, “Just do it.” Because we customize your game with our own configurable software platform, we can implement a game for you in just two weeks. If one of these choices made you think, “Aha!”, let us know you’ve got a show in mind, and we can start planning how we can bring the crowd-drawing, lead-count boosting power of our games to your booth! Click here to contact us with questions or to discuss your event with one of SocialPoint’s Digital Strategists. We’ll help you generate excitement, crowds, and leads.